Indonesia is an attractive business and investment destination. Abundant natural resources, a young and technically trained work force and a large and growing domestic market, combined with an improving investment climate and a higher global profile, are just a few of its salient strengths. With stability firmly planted after over 10 years of vibrant democratic rule, Indonesia’s vast economic potential is primed for takeoff. We welcome you as a partner in reaching for a more prosperous future. As a country with over 240 million people and a dedication to continue improving its investment climate, Indonesia is a natural market with an abundance of investment opportunities. To further encourage foreign investment and private sector-led growth, the Indonesian Investment Coordinating Board (BKPM) has become a one stop window for any foreign and domestic investor in the country. Indonesia’s investment law provides equal treatment for both domestic and foreign investors, as well as a range of incentives. 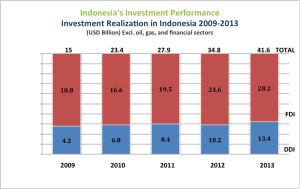 With the GDP expected to reach US$ 1trillion this year (2013), Indonesia is the largest economy in Southeast Asia. Much less affected by the global financial crisis compared to its neighboring countries, Indonesia’s economy grew by 6.3% in the first semester of 2012, making it the fastest growing G20 economy after China. Indonesia grew by 6.5% in 2011 and is expected to grow by 6.3% this year, providing a case for the country’s inclusion in the so-called BRIC economies. Future economic expansion is expected to include more inclusive growth as nominal per-capita GDP is expected to quadruple by 2020, according to a Standard Chartered report. A large part of our economic success is a result of prudent fiscal stewardship that focused on reducing the debt burden. Indonesia’s debt to GDP ratio has steadily declined from 83% in 2001 to 29% by the end of 2009; the lowest among ASEAN countries, aside from Singapore which has no government debt. The country is ranked 1st among Asia-Pacific sovereigns by Standard & Poor’s for best fiscal balance. In January 2010, Fitch ratings upgraded Indonesia’s credit rating to BB+ with a stable outlook. 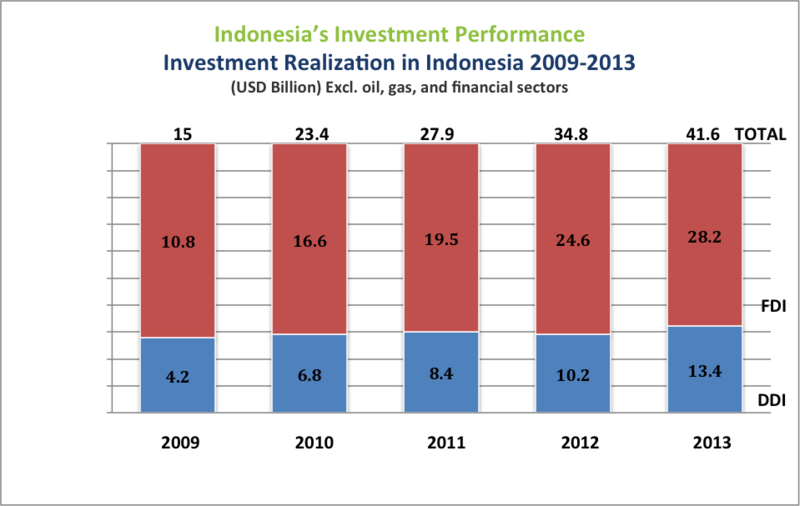 The rating upgrade is in line with Indonesia’s strong and sustained growth, and improving fiscal position. It is especially an enormous vote of confidence for investments in Indonesia – putting us only 1 notch below investment grade. Indonesia is on the right path towards attracting larger pools of fixed income and capital flows, as well as drawing in those funds which have so far been precluded from investing in non-investment grade countries. For a third time in a row, Indonesia completed another round of peaceful and successful legislative and presidential elections. Indonesia is going to hold general elections this year 2014. President Susilo Bambang Yudhoyono, now in his second term. The government will work extra hard to maintain political stability ahead of the general elections, so that the possible escalation of political tensions does not effect business. Indonesia is a renowned market for resource extraction, seen as even more attractive than for instance, South Africa, Australia and Canada in terms of mineral prospectivity, as per Pricewaterhouse Coopers. The country is home to a biodiversity that is only second to Brazil, just to mention a few. These resources provide tremendous investment opportunities. Moreover, development potential is far from saturated, particularly in renewable energy. Dynamic Demographic Base Indonesia is the 4th most populous nation in the world. Apart from its remarkable fiscal and political transformations during the last decade, Indonesia is also undergoing a major structural shift in terms of demographics. Of the 240 million people, over 50% of the population is under 29 years old, with the same percentage living in urban areas. This provides for dynamic labor market participation, growing at 2.3 million per year. A rapidly urbanizing population also provides for strategic pools of labor force in centers of investment. Coupled with this demographic bonus is Indonesia’s commitment to improve productivity and the education level of its youth, with 16% of total government expenditure on education. This expenditure is higher than any other sector. Currently, the majority of university graduates are trained in technical fields such as finance and economics (28%) or engineering and sciences (27.5%). Labor cost is still relatively low in urban centers, even as compared to urban centers of investment magnets China and India. Indonesia lies at the intersection of the Pacific Ocean, along the Malacca Straits and the Indian Ocean. Over half of all international shipping goes through Indonesian waters. Increasingly, Indonesia is playing a more dominant role in global affairs. It is Southeast Asia’s only member of the G-20, the latest global grouping for transnational economic policy. Standard Chartered sees Indonesia’s inclusion in the G-7 by 2040, provided that growth achieves its potential by 2012, moving the economy ahead of South Korea by 2016 and Japan by 2024. Indonesia is also a leading member of ASEAN, shaping integrative approaches in the region for security, trade and commerce, and will be the integral part of the ASEAN Economic Community in 2015. Finally, Indonesia is emerging as a key player on cross-cutting international policy issues as climate change, which will have direct and indirect impacts on business and investment decisions.